Mwah ha ha ha [my best evil laugh]. 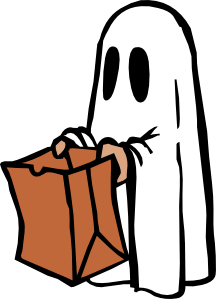 Yes, it’s that’s spooktacular time of the year again, where you can feast on yummy treats and get all dressed up in your most ghoulish outfit. 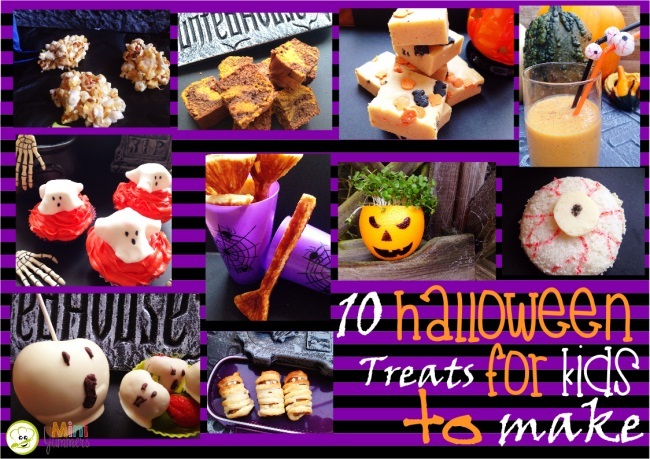 And when it comes to treats, Mini Yummers has got you covered with ten Halloween treats that are great for kids to make–no tricks! We have a mix of sweet and savoury, and even one or two that are a little healthy, but all of them are guaranteed to be yummy and spooky in equal measure. Oh, and, of course, easy to make! The problem with making fudge with kids is that usually you have to get the mixture to a super-high temperature in order for it to work. Well, with this recipe you don’t have to do that, or mess around with thermometers, it’s really easy and is just a case of melting, stirring, and pouring. 1. Break the chocolate into pieces and put into a large saucepan. Pour the condensed milk over the top. 2. Measure out the spices into a cup and give them a little mix. 3. On a gentle heat, melt the chocolate and condensed milk mixture, and keep stirring it until the chocolate is melted. 4. Add the icing sugar, pumpkin puree, and your spice mix. Give everything a really good stir. 5. Pour it into a 20 cm/8 inch square tin, that is lined with paper. Press sprinkles into the top, if using. 6. Pop in the fridge for it to set, and then get a grown-up to cut it into squares. This fudge is really creamy and yummy, and should be kept in the fridge. It can last up to 2 weeks in an airtight container, although ours has never lasted that long! You can get Halloween sprinkles from Asda for only £1. 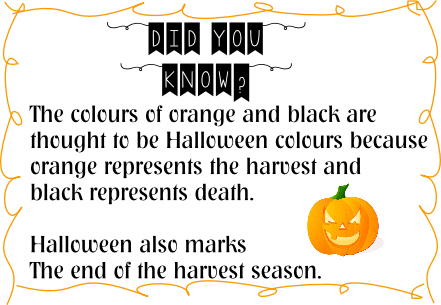 We went for the pumpkin and black cat ones, but there are a few to choose from. 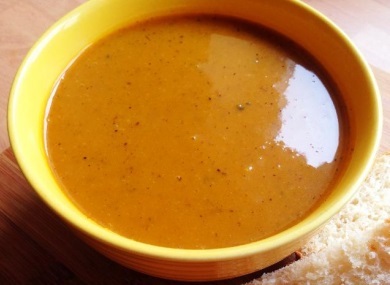 What’s the Deal with Pumpkin Puree? 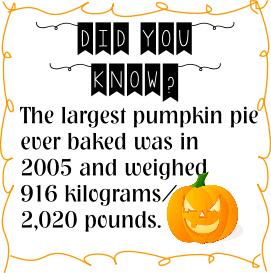 * If you can find tinned pumpkin puree then use it, but make sure it is pure pumpkin and not pumpkin pie filling. It’s sometimes called solid pumpkin. * Large supermarkets often have it in the international foods section. We found ours with the USA food in Tesco, and it was only £1.50 for a tin, which has proved ample for all the treats we’ve made. * If you can’t find the tinned stuff, then it’s not hard to make your own, but you might find it easier and cheaper to use a squash in its place. Simply cut the squash in half, scoop out the seeds, and bake the halves in their skins for about 30 mins. Then you can just scoop it out from the skin once it’s cool. They go great in a lunchbox or as part of a Halloween party spread. 1. Put the flour and butter into a bowl, and rub it between your fingers until you get a mix that looks like breadcrumbs (or you can use a food mixer for this bit). 2. Add the cheese and milk and stir until the mixture forms a ball (or give it a whizz in the mixer until it forms into a ball). Tip it out, wrap it in cling film (saran wrap) and pop it in the freezer for 15 minutes to chill. Or you can pop it in the fridge if you are going to be longer than 15 minutes. 3. Preheat the oven to 200c, 400f, gas 6. Put the dough between 2 sheets of baking paper, and use a rolling pin to flatten the dough, to about 1 cm thick (just under 1/2 inch). 4. Cut broomstick shapes from the pastry (ours were about 10 cm/4 inches long). And place them on a baking tray spaced apart a little. Make cuts to form the ‘brush’ part of the broomstick. 6. Mix the Marmite with 1 teaspoon of hot water and brush over the brooms to coat. Bake in the oven for 10 minutes or until golden brown. Allow to cool before scoffing, or the witch will find you! One of the easiest of our Halloween makes, and an especially good one for very little Mini Yummers to have a go at. We used Quorn cocktail sausages, but any type will do. 1. Roll out the pastry and cut it into narrow strips using a regular dinner knife. 2. Take a sausage in one hand, and a pastry strip in the other. Start at the bottom of the sausage and start winding the pastry around. Don’t worry if they are gaps, it just makes the bandages look more shabby and realistic. 3. If your pastry strip runs out then just pick up another one and press it into the end of the last pastry strip, and carry on winding. 4. When you get towards the top, try to leave a space about as wide as the strip you are winding with. When you’ve finished winding, press the end of the pastry into the top of the sausage. 5. 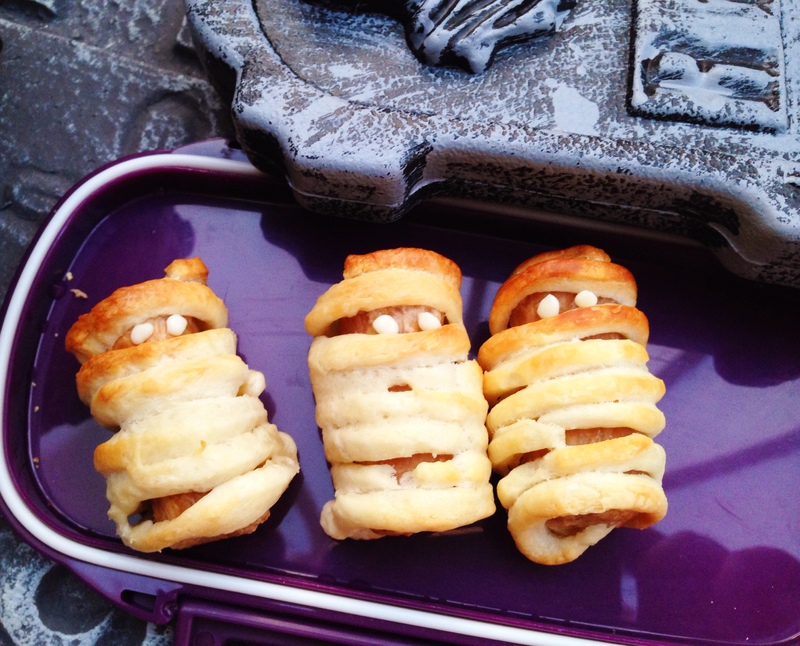 Put your mummy sausages onto a baking tray, and bake for around 20 minutes. You need to make sure the pastry has puffed and just starting to turn golden. 6. When the sausages are cooked and cooled, dot some spooky eyes in the gap you made, using either cream cheese, mustard, or mayo. 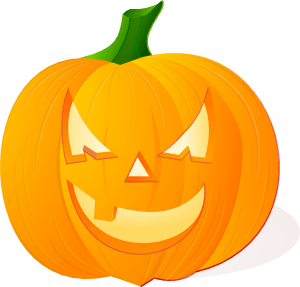 This Halloween make is great for letting the kids get creative on the jack-o-lantern theme, but without having to do any carving–using a Sharpie is way safer! Grown-ups will need to do the prep work for these, but then the spooky faces can be all the kids’ work. 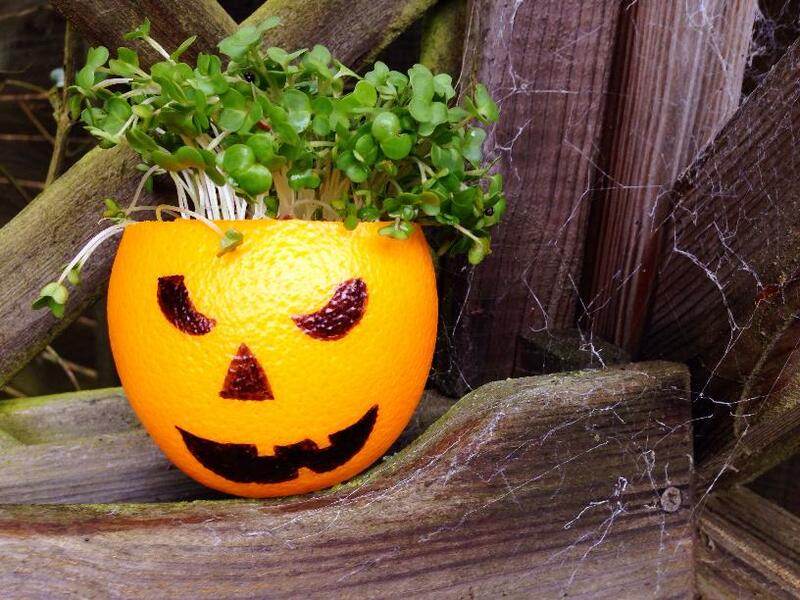 You can either buy cress seeds and ‘plant’ them in the bottom of the orange using damp cotton wool, and let the kids see the joy of them growing, or just buy a plant for about 25p and pull off sections to place inside the spooky head. 1. A grown-up will need to cut the top off the orange, and then use the knife on the main part of the orange to cut between the flesh and the skin–it makes life easier to do it this way. 2. Scoop out the orange flesh using a spoon or small ice cream scoop, and do it over a bowl so you catch most of the juice. I found it easier to go around once and get most of the flesh out, and then again, really scraping at the sides to get the peel as clean as possible. 3. Now your little ones can get to work making spooky faces on the outside of the peel. 4. When they’re done, put the cress inside and you’re done. A spooky, tasty orange jack-o-lantern. You can use the orange juice and flesh in a smoothie or a salad dressing, so nothing goes to waste. 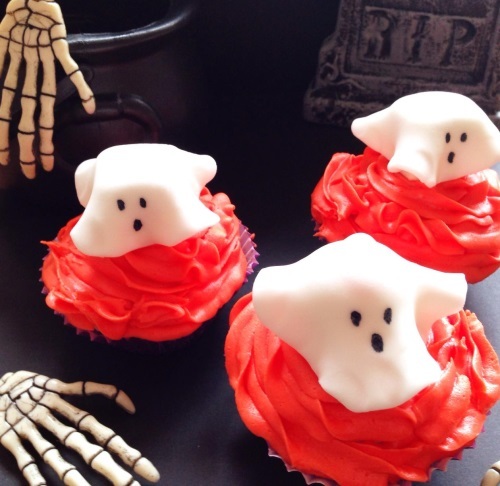 This is one of the best Halloween cake recipes for kids, as it’s easy but looks so effective when finished–almost like the ghosts are floating above the cupcakes. Using plain, storebought cakes is fine if you don’t have time to make your own, there’s still a lot of fun to be had by just decorating them. Or do as we did and use our carrot cake recipe. Or, use the simple sponge recipe below–you can freeze any cakes that you don’t use for another time. Mix the butter and sugar together until creamy. Beat in the other ingredients. Spoon into cupcake cases and bake for around 20 mins at 180c, 350f, gas 4. Frosting–300g (2 cups) icing sugar, 100g (1 stick) butter, 30ml (2 tbsps) milk, 1/4 tsp vanilla extract. 1. Mix your frosting ingredients together until creamy, and add the food colouring of your choice–you can make it a colour mixing lesson for littler cooks red+yellow=orange, etc. 2. Pile the frosting over the cupcakes or use a squeezy decorating bottle and make fancy patterns. Place a marshmallow or Rolo into the centre of the frosting. 3. Roll out some fondant and cut out six circles about 8cm/3 inches across. Pick up each circle and go around the outside, pressing with your finger and thumb to thin it out and shape it. 4. Put a small dot of frosting on top of each marshmallow/Rolo, and place your fondant circle over the top–it should hang, with loose sides, like a ghost. 5. Allow the fondant to dry out a little, and then draw on a simple ghostly face. 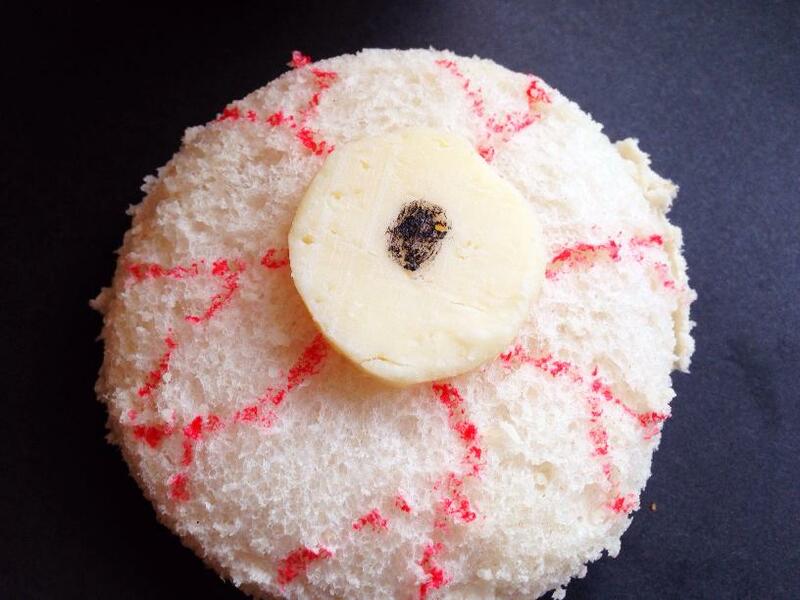 Super-easy, super-spooky, and made really quickly, these gruesome eyeball sandwiches are perfect for any party or Halloween lunchbox. Grab your food colouring pens (or a paintbrush and liquid food colour) and let’s get gruesome. You can use the classic peanut butter and jelly filling to make your uncrustable sandwich, or any other combination you can think of. This works well with wet ingredients–not slices of ham or grated cheese, for example. We like cheese spread with mango chutney, but let your imaginations run wild! 1. Press the top of the glass gently into one of the slices of bread–this gives you a circle mark to work from. 2. Spread your fillings within the circle impression you’ve just made. 3. Put the other slice of bread over the top. Press the glass carefully but firmly through both slices of bread until you’ve cut out a circle shape. The edge of the glass should have sealed your sandwich. 4. Get a grown up to cut out a circle of cheese, and glue it to the middle of the sandwich using a little peanut butter or cheese spread. 5. Using your food pens, draw squiggly red lines from the edge of the cheese to the outside of the sandwich, and a black circle in the middle of the cheese circle. If you want something a little more 3D, then try making an eyeball sandwich ball, as featured on Eats Amazing. “Bubble, Bubble, Toil, and Trouble,” say the witches. But I promise you that these brownies will give you no trouble at all. Don’t be put off by the length of the ingredients list, you really just need to mix it up, separate into 2 bowls, flavour one chocolate and one pumpkin, swirl together and bake. 1. Preheat your oven to 180c/350f/gas 4. Butter a 20cm (8-9 inch) square baking tin, and line it with baking parchment or greaseproof paper. 2. Melt the chocolate and butter in a heatproof bowl in the microwave for 20 seconds at a time. Give a stir after each interval, until both have melted. Stir to make it smooth. 3. Mix the flour, baking powder, and salt in a large bowl.Put sugar, eggs, and vanilla in the bowl of an electric mixer and beat until fluffy–you can do this by hand but it takes longer. Fold in the flour mixture. 4. Move half of the mixture into another bowl. Stir the melted chocolate mix into one bowl and the pumpkin, oil, cinnamon and nutmeg into the other. 5. Spoon half of the chocolate cake mix into the baking tin and smooth over with a spoon. Top this with half of the pumpkin cake mix, and smooth this over too. 6. Repeat the above step. Then use a dinner knife or small spoon to swirl the two mixtures around each other–don’t do this too much as it will all become one colour, and we want to keep the colours swirling together but separate. 7. Bake for 40-45 minutes. Rememver that a brownie should be crisp on the outside, but slightly fudgy in the centre. 8. Let it cool and then cut into 16 squares. Yes, it’s fruit time, but as they are covered in chocolate I’m not going to pretend these are super healthy, but it’s a nice break from the usual rubbishy sweets and candy that you usually scoff at Halloween. And these are way cuter as well as being fun to make. 1. Wash and gently pat the fruit dry. Push a stick into the top of the apple, as far as you can, but not out the other side! Get a sheet of baking parchment ready. 2. Melt the white chocolate in a small heatproof bowl in the microwave for 20 seconds at a time. Give it a stir after each 20 seconds. It’s really important not to over melt the white chocolate as it can go grainy and disgusting really quickly. 3. Stick the apple into the melted chocolate, using the stick as a handle, and move it around in the chocolate to make sure it’s coated. Put it onto the paper. 4. Hold the strawberries by their greenery and dunk them into the chocolate. Put them onto the paper too. 5. Put them somewhere cool to set. 6. Snip a very small corner from a bottom corner of the food bag. Melt the dark chocolate using the same method as you did for the white chocolate. Once melted, spoon it into the food bag. 7. Push the melted chocolate gently towards the hole in the bag you just made. 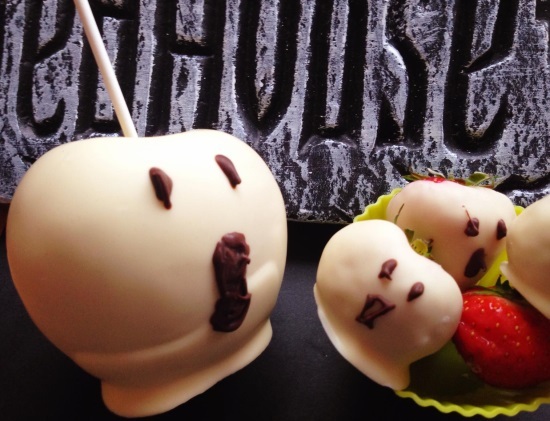 Now draw spooky faces onto the fruit using the melted chocolate. You can practice on the paper first if you need to. Put aside to set, and then scoff the frightful fruit. 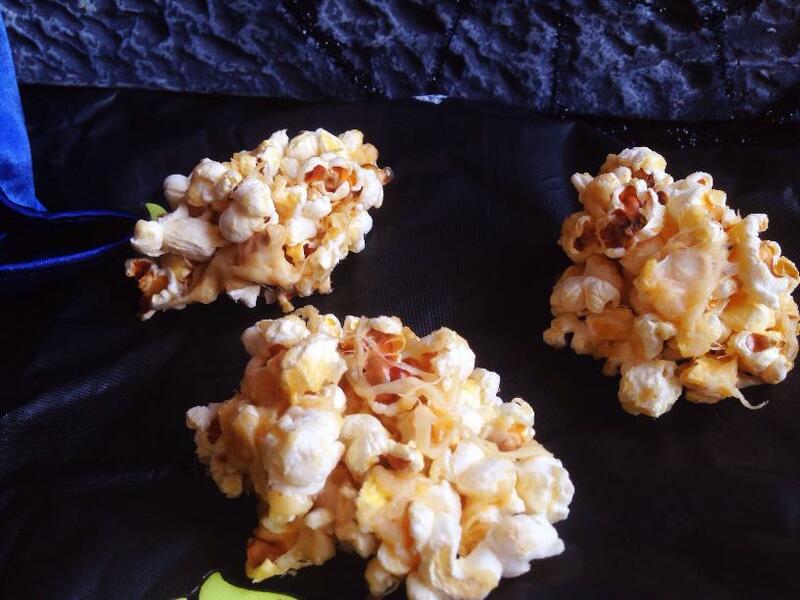 For something a little bit different, why not give the gruesome twosome of cheese and popcorn a whirl. Sounds weird, but actually tastes pretty good. A grown-up needs to do the shaping of these as the mixture gets really hot. 1. Put the oil and popcorn into a large pan with a lid. Put the cheese and paprika into a small saucepan. Get a bowl ready. 2. Shake the popcorn around in the oil and heat it on a high heat, making sure the lid is secure. Melt the cheese mix until it bubbles–keep it on a low heat if it’s ready before the popcorn. 3. Once the popcorn stops popping, take it off the heat. Pour about half of the popcorn into the bowl along with half of the hot cheese. Put the cheese pan back onto the heat to keep it warm. 4. Working quickly, a grown-up should mix the cheese and popcorn mix in the bowl, and using a large spoon and their hands, shape rough brain shapes–you should be able to make 3 ‘brains’. Pop them on some baking parchment to set. 5. Pour the rest of the popcorn and cheese mix into the bowl, and repeat the shaping exercise again, making another 3 ‘brains’. These popcorn brains should be eaten on the day they are made. Who doesn’t love a nice slime and eyeball smoothie? What do you mean you’ve never tried one? It’s one of the best Halloween drink ideas! OK, so what if I tell you it’s pumpkin, banana and sultana, with some added fondant eyeballs for decoration. Yep, sounds a bit better. 1. Roll some pieces of fondant around in your palms to make round shapes. Push them over a straw to make the hole. Then put them onto another straw to dry out a bit. You can leave them standing up in an empty cup to dry for a couple of days if you wish. 3. Break the banana into pieces and put everything into the blender. 4. Whizz the ingredients in the blender until most of it is smooth, but there are still some whole sultanas left in the mix–yummy floating eyeballs. 5. 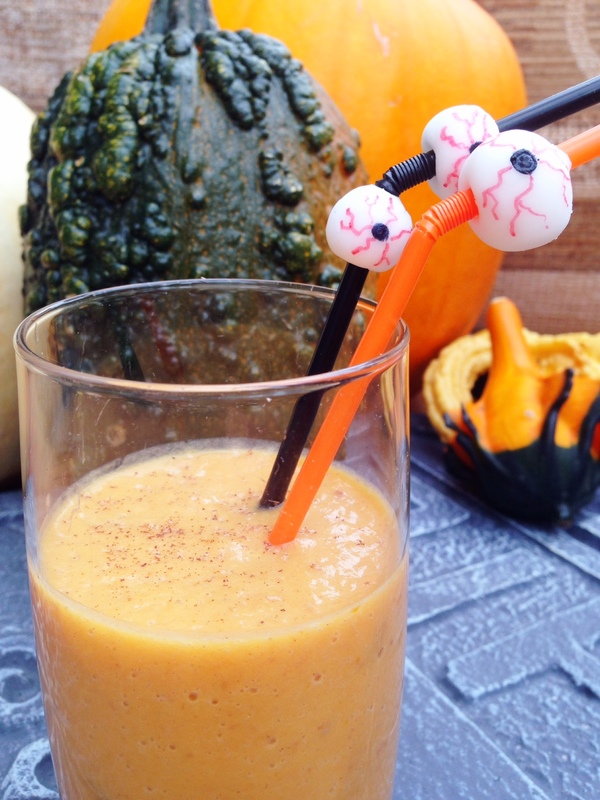 Serve in a glass with your spooky eyeball straws. Have some pumpkin or squash leftover? Turn it into some delicious soup. Click here for our recipe. So many great ideas! I love how you adapted my sandwich ball idea and thanks for the info about pumpkin puree – I had no idea it was so easy to make yourself!